One of the eye-catchers at the Tokyo show was the Prince 1900 Sprint, a striking if not beautiful sport Coupé designed by Scaglione of Italy. It seems to share the basic body unit and suspension with the recently introduced Skyline 1500 saloon but the engine is a tuned 1,862 c.c. four-cylinder unit of the big Gloria. The maker rather hopefully claims its top speed to be 112 m.p.h. but there seems no possibility of going into production with it. 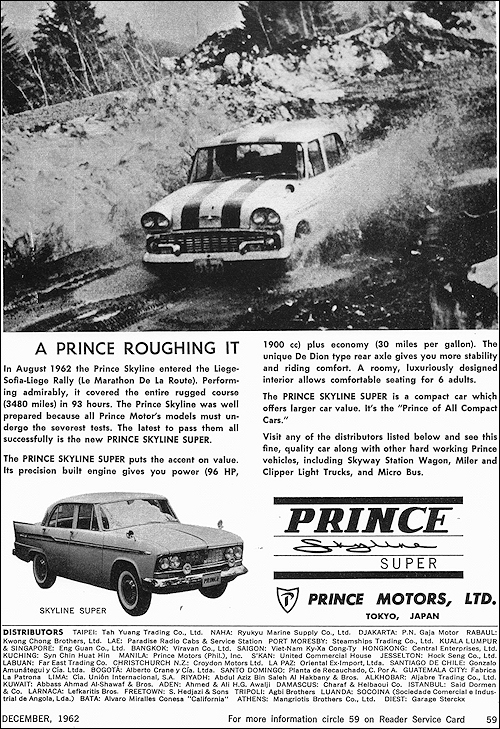 Prince Motor Company, whose production hitherto was limited to the 2,000 c.c. saloon, is attempting to break into the smaller car market by introducing a new Skyline 1500 on the eve of the show. 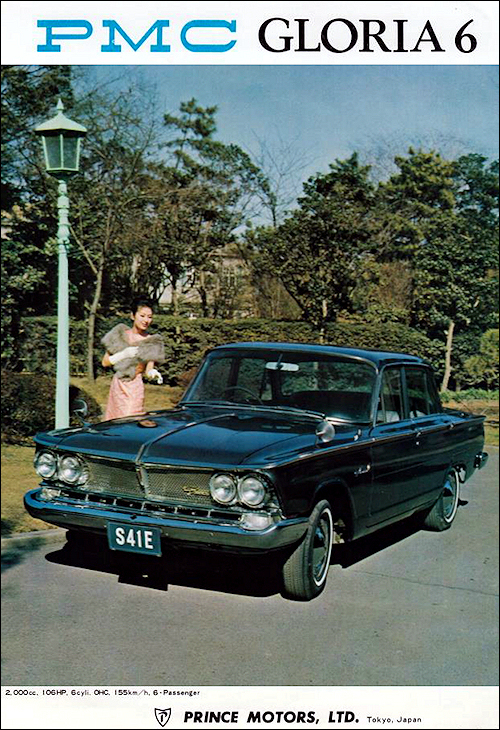 It is a rather conventional monocoque four-door saloon powered with a 1,484c.c. 70 b.h.p. engine. The gearbox is an all-synchromesh three speed with a column shift. Two final drive ratios are offered, 4.11 and 4.44 to 1. On this car routine maintenance is very much simplified; the engine is guaranteed for 25,000 miles, engine lubricant is changed every 3,000 miles and chassis lubrication is required only once a year. I do not think, however, that this easy maintenance gives an excuse for the rather vague steering resulting from a liberal use of rubber bushings. 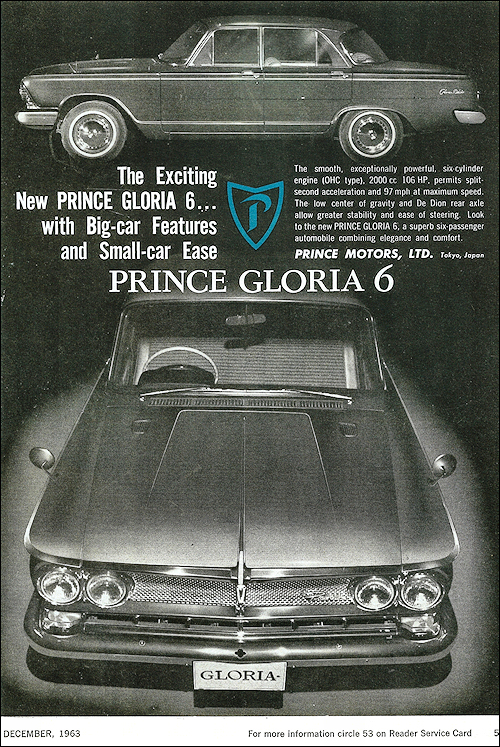 Prince's prestige model is the Gloria Super Six in production since early summer of this year. The Corvair inspired body is common with the 4-cylinder Gloria 1900, but under its long, flat deck is installed a very Mercedes-like 6-cylinder single o.h.c. 1,988 c.c. engine, developing 105 b.h.p. at 5,200 r.p.m. The engine is good for over 6,000 r.p.m.. With its high gearing, the Gloria Super Six is the only Japanese car that has the Continental flavour. 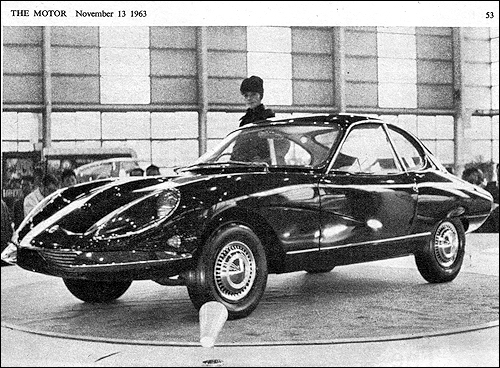 Prince also displayed a prototype Gloria built with larger 6-cylinder 2,500c.c. engine and an automatic transmission. This must be one solution to cope with the ponderous weight of the Gloria. 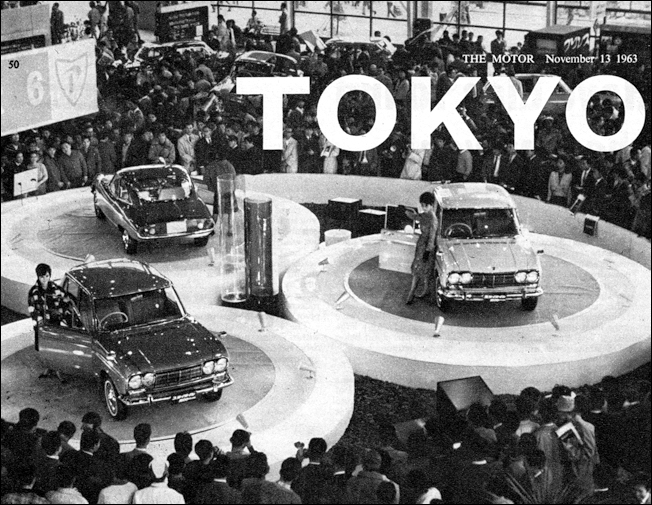 Skyline at Tokio Motor Show. A 1900 c.c. engine with twin S.U. 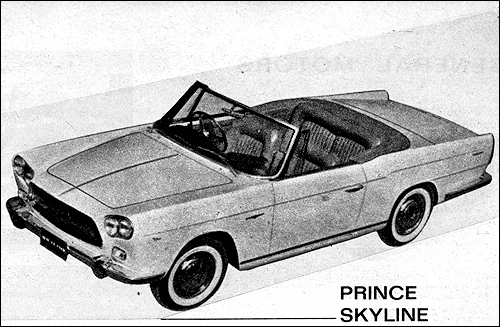 carburetters gives the attractove Prince 1900 Sprint a claimed speed of 112 m.p.h. 1900 Sprint by Scaglione at Tokio Motor Show.